You’ll be seeing the graph below a lot in the next few days and weeks. 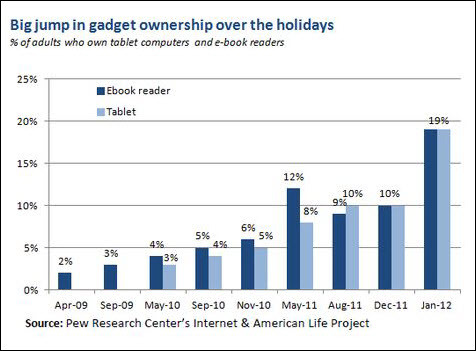 Often the headline will read “20 per cent of Americans Own an e-Reader” or “Tablet and E-Book Reader Ownership Double Over the Holiday Gift-Giving Period” which is the theme of the Pew report announcement. But the big number appears on page two of the full report: “The number of Americans owning at least one of these digital reading devices jumped…to 29% in January.” I’m rounding it up to a third. You know, margin of error. It’s not a big number. It’s a huge number. For anyone doubting that the ebook explosion is racing forward at a tremendous pace, here’s proof as scientific and as unbiased as you can find. As of today, many people have been playing with their new toys for less than a month. So reading too deeply into today’s ebook sales data will provide contradictory results. We’ll know much more by March or April as early buying patterns settle. The recent revision to 2014 instead of 2015 for 50% of all book sales going digital looks sound. I’m in New York at Digital Book World 2012. More to follow.